SWENN Bolts, Nuts & Washers are approved by Group Consult Int’l for DAMAC HEIGHTS Residential Building project. Our company was officially appointed by DEKS INDUSTRIES Australia as the Master Distributor for the Middle East. SWENN Bolts, Nuts & Washers and TRUWELD Shear Studs are approved for Al Jalila Children’s Specialty Hospital project. 2nd surveillance for ISO 9001:2000 was done & the continuation of the certification was confirmed. SWENN Bolts, Nuts & Washers are approved by "DSA" for the One & Only Royal Mirage phase 3 in Palm Jumeirah. SWENN Bolts, Nuts & Washers are approved by “Dar Al Omran” for the Detainees Building in Abu Dhabi. SWENN Bolts, Nuts & Washers are approved by “Cansult Maunsell LTD” for ETIHAD Towers project in Abu Dhabi. Philipp Spherical Head Anchor System is approved by “Pell Frischmann – CONSECO Int’l” for Mussafah workforce community. SWENN Screws, Rivets & Color Caps, ZOTEFOAMS Filler Blocks, OLIN Butyl Sealant tapes, SHURTAPE Purlin Tapes, GESIPA Bulb-Tite Rivets are approved by “Al Wasl Al Jadeed Consultants” for the South showrooms, offices & warehouses at JAFZA. SWENN Bolts, Nuts & Washers are approved by “KLING CONSULT” for Dubai Biotechnology & Research Park Project. Recertification of ISO 9001:2000 was awarded and is valid till 07 March 2011. SWENN Bolts, Nuts & Washers are approved by “Dar Al Handasah” for employee & Free Zone gates at Dubai World Central Int’l Airport. SWENN Bolts, Nuts & Washers are approved by “FEWA” for Al Zawra Central Power Plant Fuel Oil & Fire Protection System. HECO Multi Monti screws are approved by Dar Al Handasah” for Cargo Terminal Building at Dubai World Central Int’l Airport. 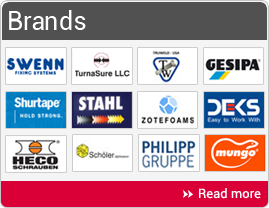 Bright Star is proud to announce that it has been appointed by HECO Germany as their representatives in the region.HECO offers the innovative fastening system for concrete and masonry with building regulation approval.The MULTI-MOUNTI Concrete Anchor Screw is the 1st Anchor Screw with ETA Approval. The approved MULTI-MOUNTI installation system is based on a new concept in anchoring technology. The Anchor Screw is set without a plug, thus saving a huge amount of time. Tru Weld Shear Studs are approved by “Overseas Bechtel, Inc” for the passenger Terminal Complex at NDIA. Philipp Sandwich Panel Anchor System is approved by “NASA Multiplex” for Burj Dubai Residences phase 3. Philipp Fixing Sockets are approved by “Katib & Alami” for Al Jazeera Towers project in Abu Dhabi. SWENN Bolts, Nuts & Washers are approved by “Dar Al Handasah” for Terminal 3 Concourse 2 and car park at Dubai Int’l Airport expansion phase 2. Philipp Fixing Sockets are approved by “Hok and Shankland Cox Ltd” for Zayed University at Al Ruwayyah, Dubai. Re-certification of ISO 9001:2000 was awarded and is valid till 07 March 2008. Bright Star was awarded the ISO 9001:2000 certification. The scope is “Trading in Speciality Fasteners” & the certification is valid for three years. Bright Star started the implementation of a Quality Management program that meets the requirements of ISO 9001:2000 standard and has appointed Bureau Veritas as consultants for the project.